I was tired. I was hungry. I had lots of other things to do. But wild horses couldn’t have kept me away from this year’s FilmCamp. Like the label says: it’s a meeting of film enthusiasts. In Phnom Penh, Cambodia. I’d first encountered the organizers ‘Kon Khmer Koun Khmer’ at their amazing ‘Golden Reawakening’ film festival, capped by a euphoric dance party featuring 60s-70s era rock and period clothes. It set a precedent that was hard to top. 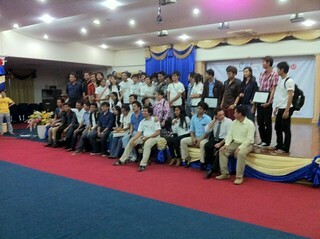 Many of the participants (such as Sithen Sum, Kounila Keo) came from the world of Cambodian blogs. Remember the world before Facebook? That’s how a lot of us used to communicate. Many of these bloggers were older than the films they were unearthing: children of the 1980s postwar baby boom unearthing classics from the 1960s and early 1970s. For them, it created a fascinating cultural bridge to a time long gone by, the culture of their parents. Many of us (local and foreign) had met informally. We’d seen blogging and internet use expand dramatically after the ‘Personal Information Technology’ workshops. Then events like the Clogger Summit / Clogger Corner – and especially BarCamps – helped this community cohere. For most us, BarCamps were an annual convention of comeraderie both for the Khmer blogging community and foreign enthusiasts who took interest – like Preetam Rai of Global Voices, tech pundit Beth Kanter – as well as a growing number of overseas Khmer and in-country barangs (like yours truly). Due to the fairly late introduction of Khmer Unicode, most blogged in English, making the Khmer blogosphere (if such a thing could be labled) fairly easy to explore for the international community. Which brings us this year’s FilmCamp. I’m seeing many of the familiar faces from BarCamps, showing the same level of enthusiasm for a quite diverse collection of screenings, awards and discussions that must have kept the team up late planning and organizing. It’s great to see more partners jumping on the bandwagon, from business sponsors to other film entities. I’m not sensing any apprehensions about censorship, (though I should note that my Cambodian friends have a finely tuned second sense about exactly how far to push a topic or discussion). Why was I so intrigued? It’s great to see the the model of technology-oriented BarCamps and Unconferences specifically applied towards culture – indeed, any area of discussion. This is a great, accessible model for opening up artistic discussion in a framework that feels safe and nonthreatening. What could be next? LitCamp? ArtCamp? The sky’s the limit. Held at Pannasastra University, there’s a lot less tweeting and Facebooking than your average tech meeting. But then, this is more about culture. I think the urge to say ‘Hi, I’m here!’ is fading as youth get more sophisticated with their smartphones. 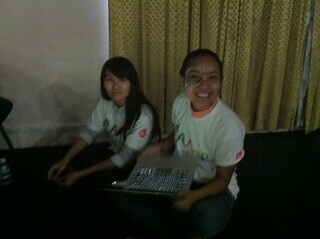 The FilmCamp team was clever to get sponsorship from companies like Sabay.com and Legend Cinemas. I’m seeing an inverse proportion between advertising presence and cinemas/organizations having legal screening rights. 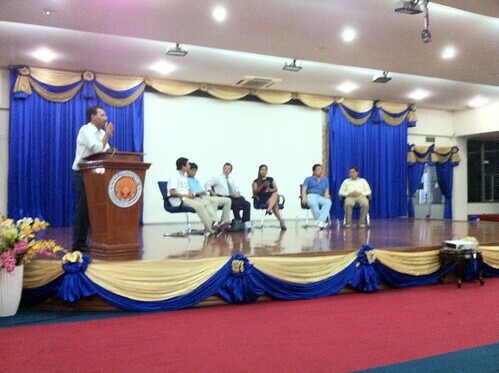 There are many filmmakers / film facilitators here, some of who take opposing views about the state of Cambodian film. They’re all on their best behavior. 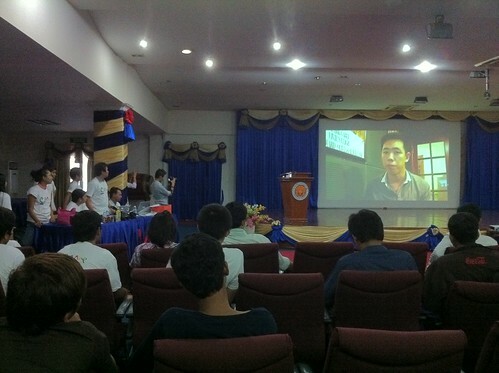 During the awards, a taped message from a Vietnamese filmmaker notes that he was surprised to learn about Cambodian filmmaking efforts, and enthused to meet like minds. He closes with ‘Akun’ garnering a wave of laughter and applause. One panelist mentions his Eastern bloc film training in Russia, prior to UNTAC. We’ve seen a lot of change since then. Discussion of a ‘career track’ for Filmmakers: there are film courses but more of a professional path is needed. Closing songs by ‘Small Word – Small Band’. We should totally have live music at every BarCamp. Local creators should support … local creators in other media. Why should you host a meeting/conference/’camp’ in Cambodia? Because Cambodia has a growing, enthusiastic base of experienced conference facilitators/volunteers and an enthusiasm to connect with the international community. 2. You can conduct your meeting in English. It’s the ‘lingua franca’ of tech meetings and the internet, in part due to its late implementation of Khmer language Unicode for the Internet in 2005. It’s not Singapore exactly, but everyone seems to be engaged in improving their English. There is no nationalist bias towards Khmer language. Locals are appreciative when visitors make an effort to engage with local language and culture. 3. Unless you’re holding a political rally, the government is pretty ‘hands off’. 1. Cambodia is full of surprises in terms of infrastructure. A traffic jam or a power cut can always throw plans for a loop. Scope out your venue, have a backup plan in mind. 2. The Cambodian hospitality industry is growing. Visitors will find a warm welcome, but some conveniences you might expect in the Western world may be less available.